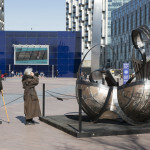 Acclaimed artist Kalliopi Lemos and Greenwich Peninsula are delighted to announce the inaugural public placement of a trio of sculptures. 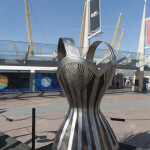 The celebrated works form part of an ongoing series ‘Tools of Endearment’ – Bra (displayed at Les Moulins, France); Stiletto Heel (displayed at Golden Square, Soho, London) and the never before seen Corset will be on view for the first time on Peninsula Square, from 1st February. 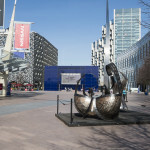 As part of the Greenwich Peninsula’s commitment to embedding art into the fabric of their new community, this trio of sculptures are intended to spark conversion and set the tone for innovative thinking. Greenwich Peninsula demonstrates its on-going interest in art in unusual places, exceptional design and creating thoughtful dialogue. Lemos’ Tools of Endearment opens up a contemporary discourse about the role of femininity – both historically and in the current climate. 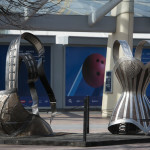 These monumental sculptures simultaneously beautify and adorn the public space in which they occupy. 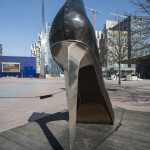 As art critic Gelly Grintaki comments, ‘these ambiguous and enormous Lemos’ objects, a – literally stiletto heel pump, a bra left on the floor and a corset-armour, all made of steel, could be seen as the remains of a giantess’ boudoir, leftovers of a goddess’ panoply after a fight, indicating the beginning of a post-feministic narrative about beauty, oppression and power. Gracious monuments of the possible, of a tangible present and a future under construction while the imaginary giantess-heroine is very much alive and strong’. Kalliopi Lemos has been approaching women’s issues through the whole of her work with an exceptional sensitivity and specificity. Cohesive substance in her multidimensional artistic practice is her broad humanitarian vision. An authentic care for every otherness and an eagerness to give back the powerless her/his lost dignity. Her Woman captured in animal bodies, imprisoned mermaid, lost and desperate immigrant or fetishized female body, balancing between glorifying beauty and archetypal pain, is the eternal symbol of any marginal, repressed or subjugated being. There is a witty antithesis’ game in Lemos’ sculptural idiom; between dimensions (a term of endearment is usually significant of something small and cute), material qualities (something that is supposed to be soft made by something hard) and space (the intimate place of a woman’s wardrobe challenging the urban landscape). 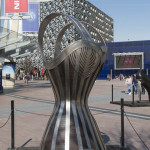 The sculptural synthesis thus seems to open a peephole/rabbithole in the public space-time, while questioning the male gaze and the sexual objectification over the intimacy and autonomy of the female body through centuries”. 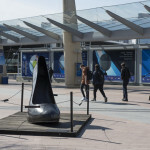 Currently involved in a number of projects and public placements internationally, including her most recent participation at the Palais de la Porte Doree with her work Pledges, as well as her involvement with Spitalfields’ rolling art programme through her installation Wooden Boat with Seven People, Lemos’ work continues to participate within a visual sphere of knowledge, perception and awareness into a global narrative.